Surface Treatment Rollerball pen with elegant shape,produced by professional metal pen. Barrel in plated.Intense high gloss finish. High quality and noble design. Delivery time 7-20 working days after sample approval for the MOQ. The more the longer. It depends on your total order quantities. Usage: Promotion, Souvenir, Gift.Office and School. 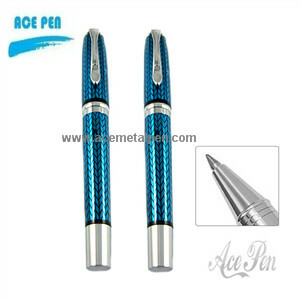 Feature 1) metal ball pen with the different material(aluminum or copper or steel or stainless steel or carbon fibre).